Based on the phenomenally popular, long-running musical stage production which debuted in 1985, which itself was based on Victor Hugo’s 1862 novel, this musical big screen adaptation of arguably the greatest French novel was a long time coming. Attempts were made at bringing the musical version of Les Mis to the big screen since the 1990s, but the various productions fell through time and again, while several non-musical adaptations of Hugo’s magnum opus were featured both in the theater and on television, only finally moving full steam ahead in 2011, when Tom Hooper, fresh off his acclaimed historical drama The King’s Speech, came onboard. I’ll be honest—I am not, in general, a particular fan of musicals, and while I have seen one stage production of Les Mis, I am not really an expert, and not really in a position to say how satisfied the musical’s legion of fans will be by this film (though I suspect many of them should be). I have skimmed Hugo’s notoriously dense, 1,000 + page novel, but, while I like the story, I found myself unable to forge through in its entirety. In fact, I’ve always been partial to the 1998 non-musical film starring Liam Neeson and Geoffrey Rush (although some of its omissions, including the character of Eponine, rankled fans). Even so, Les Mis is a lavish, sumptuous experience, with plenty of emotionally stirring moments along the way. It’s also as pure a musical as they come–lines of spoken dialogue are few and brief. Those for whom musicals are unbearable are not likely to have their opinion changed here. But for those who enjoy them, and especially for fans of this musical in particular, there is much to appreciate. At least the broad strokes of the story will be familiar to many viewers. We open in 1815 France, where convict Jean Valjean (Hugh Jackman) is finally paroled after nineteen years of hard labor. Bitter and dejected, with every door shut in his face, Jean quickly returns to crime, but a chance encounter with a sympathetic Bishop (Colm Wilkinson, the original stage Jean) leads him to reassess his life, and he breaks parole and disappears. Eight years later, Jean has completely reinvented himself as the respectable, kindly Mayor of a small French town where he owns a factory whose workers include Fantine (Anne Hathaway), who resorts to selling her hair and teeth and prostitution to support her young illegitimate daughter Cosette (Isabelle Allen). By the time Jean learns of Fantine’s plight, she is mortally ill, but he makes the dying woman a vow to protect Cosette that will guide his destiny for the rest of his life. Meanwhile, Jean goes on the run again to avoid the new chief of police Inspector Javert (Russell Crowe), a stern policeman who watched over Jean in his prison guard days and is single-mindedly devoted to his black-and-white, absolutist view of law and justice. With a quick detour to rescue Cosette from the greasy fingers of the money-grubbing Thenardiers (Sacha Baron Cohen and Helena Bonham Carter), Jean makes a narrow escape from the dogged Javert in Paris. There, he and Cosette will live in peace for nine years, but complications crop up in the forms of Marius (Eddie Redmayne), a young would-be revolutionary who begins a starcrossed romance with Cosette (now Amanda Seyfried), the meddling Thenardiers, now Parisian thieves who turn up like bad pennies, and their daughter Eponine (Samantha Barks), who fosters an unrequited love for Marius. And as Marius and his cohorts set their uprising in motion, Jean is torn between stepping out of hiding to save his adopted daughter’s lover, and his fear of exposing himself to Javert. Hooper did two unusual things in his casting. Firstly, he cast “name” movie stars who are actors first and, at most, singers second, some not typically associated with singing roles. Secondly, he had his cast perform all their own singing live on camera rather than the more typical movie process of the actors pre-recording their vocals in a studio and then lip-syncing to them in the scene, leaving everyone to sink or swim on their own vocal ability or lack thereof, without benefit of auto tuning or studio touch-ups. Most of the cast has some level of singing experience; Hugh Jackman has sang onstage in various Broadway roles, Russell Crowe headlines his own rock band on the side, Anne Hathaway is a trained soprano, and Amanda Seyfried appeared in the big-screen adaptation of Mamma Mia!, but with the exceptions of Samantha Barks, who previously played Eponine onstage and reprises her role onscreen, and perhaps Jackman, none of them would generally be thought of as “professional” singers. Hooper’s approach produces singing that is sometimes a little rough and unpolished, but also lends a “realness” and an emotional immediacy to the performances. Rather than lip-syncing to their own vocals which they recorded perhaps months earlier in a studio, the cast is required to sing and feel them live and in the moment. It was likely a challenging approach for many cast members, especially the less musically experienced, but it also pays off in several key scenes. Overall, the cast is solid. Hugh Jackman’s portrayal of Jean Valjean is emotional and impassioned–although his voice occasionally strains to hit his highest or biggest notes–making him a sturdy lead around which the film can anchor itself. Jackman also undergoes a notable physical transformation from the emaciated, scarred, scraggly bearded prisoner at the beginning–he lost thirty pounds–to the dapper gentleman Jean reinvents himself as (he’s certainly a long way from X-Men’s Wolverine). 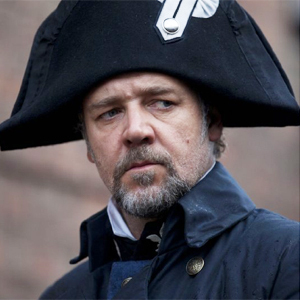 Russell Crowe is fine, if not spectacular, as Javert. Rather than bringing the ferocious intensity one may have expected from him, Crowe is surprisingly low-key and understated. In fact, one could argue Crowe is a little too subdued, never really conveying the fevered zealous obsession of Geoffrey Rush’s Javert from the 1998 version, coming across instead as a more generic dogged and dour policeman who’s stern but not as cruel as the more hissable Rush. Javert is not a “villain”, just narrow-minded and unshakably convinced of his own rectitude, and Crowe plays his law dog with a straightforward earnestness that’s ultimately a little pitiable. Crowe’s singing has received much online panning, but while he’s clearly not the strongest of singers, his vocals range from adequate to fairly good, especially in his rendition of “Stars” midway through. The most arresting presence is Anne Hathaway, despite her limited screentime consisting of a few scenes early in the movie. 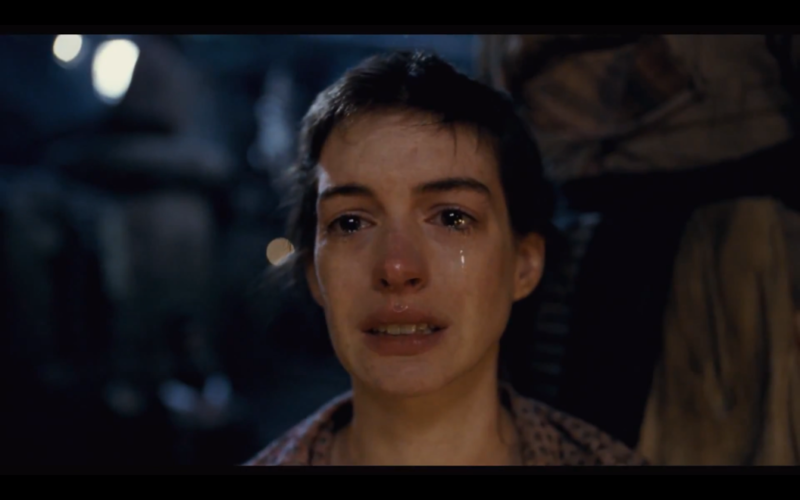 Hathaway surpasses even Jackman for making herself look truly wretched, including having her hair chopped off on camera and losing significant weight off her already slender frame, and her downward spiral culminates in a mesmerizing, tearjerking rendition of “I Dreamed a Dream”, the movie’s most emotionally raw number, that holds the audience riveted for five unbroken minutes. Hathaway seems to tap into some place deep within herself and tear Fantine’s anguish forth, and her efforts should make her a lock for an Oscar nomination. Amanda Seyfried is lovely and has a nice voice, but has little to do. Cosette, whose role was bumped up in the 1998 version (albeit not entirely effectually) is reduced here to a thinly-drawn plot device. More time is spent on Marius and Eponine, who, to be fair, at least in this production, are more compelling characters. Eddie Redmayne brings a youthful spark and earnestness to Marius that enlivens a sometimes bland and thinly-developed character, and delivers an impassioned rendition of his solo, “Empty Chairs at Empty Tables”. Previously best-known opposite Michelle Williams’ Marilyn Monroe in last year’s My Week with Marilyn, Redmayne has earned the right to wider recognition after this. Samantha Barks had already proven herself as Eponine onstage, and it’s no surprise that she is probably the most accomplished singer in the cast, and her singing/acting is emotional and impassioned; her “On My Own” is the most arresting and tearjerking number besides Hathaway’s “I Dreamed a Dream”. Sacha Baron Cohen and Helena Bonham Carter provide a dash of comic relief as the slimy but fatuous Thenardiers. Both dive in with eccentric abandon, and do their share of scene-stealing and scenery-chewing, although there are times when their broadly-played villainy is a notch overly cartoonish; while Crowe perhaps shows too much restraint, Cohen and Carter could have exercised a little more. This is the kind of hammy overacting that sometimes plays better on the stage than the screen. Of course, the big screen opens up Les Mis in ways a stage simply cannot, and Hooper delights in crafting epic spectacle, including sweeping shots of 1800s Paris and the barricades. Hooper is overly fond of long unbroken close-ups and oddly tilted camera angles. Sometimes it works, such as in “I Dreamed a Dream”, when the camera stays in one completely unbroken close-up on Hathaway’s devastated face for five straight minutes, but at other times it’s overused. It’s a minor quibble, but an occasionally distracting one. Les Mis starts out feeling a little rushed, zipping briskly from one musical number to the next with little segue in between (although this is also the feel of the stage production). The 1998 version gave more development to the dynamics of Jean/Javert, Jean/Fantine, and Cosette/Marius, while here Fantine and Jean are only fleetingly acquainted, Cosette and Marius lock gazes and are instantly “in love”, and Jean and Javert cross paths repeatedly but don’t muster the searing intensity in their confrontations that Liam Neeson and Geoffrey Rush generated in 1998. 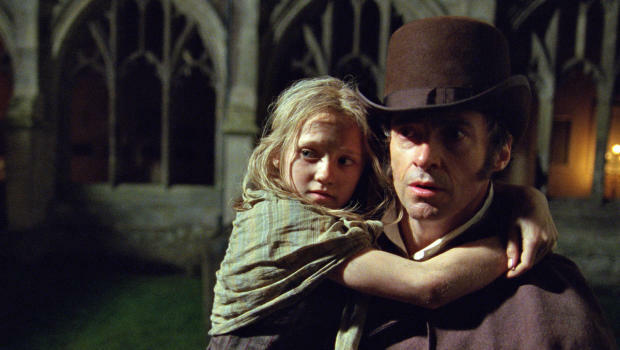 The 1998 film bumped up Cosette’s role, while here, she’s the cypher and plot device she was on the page, with Marius receiving more focus and screentime. The movie starts to find its footing when we begin Fantine’s downward spiral, and the Thenardiers’ garish “Master of the House”—filled with visual gags—livens things up, but it’s when we get to the barricades that the movie is the most rousing and stirring. Along the way there are a couple exciting sequences, including a chase through Paris and Jean and Javert’s furious “Confrontation” duet acted out as a swordfight, but aside from “I Dreamed a Dream”, the last third is where most of the goosebump-inducing moments are. Tears are likely to flow several times. The movie loses momentum after the fall of the barricade and Javert’s suicide, and the final few scenes drag a bit, though the conclusion is tearjerking enough to end it on a strong note. Characters like Gavroche (Daniel Huttlestone) and Marius’ revolutionary co-ringleader Enjolras (Broadway star Aaron Tveit), who were reduced to window dressing in the 1998 version, are more prominent here, and key moments, including theirs and Eponine’s fates, are faithfully included. Hooper takes various steps to pay homage to Les Mis in its various incarnations. In addition to the presence of Samantha Barks as Eponine, the original stage Eponine, Frances Ruffelle, has a cameo as a prostitute, and the original stage Jean Valjean, Colm Wilkinson, plays the Bishop of Digne. Many extras and minor roles are played by alumni of various Les Mis stage productions. Most of the musical’s songs, while with a few lines cut here and there, are faithfully presented, with “Dog Eat Dog” the only significant omission (a new original number, “Suddenly”, was also added specifically for the movie, presumably to make it eligible for awards consideration). Hooper also throws in a couple small touches that are usually absent from the musical but taken straight from the novel itself, including Marius’ grandfather, and also tosses in a poignantly unexpected moment involving Javert and a certain young barricades casualty that makes all the more impact because it comes as such a surprise. Devotees of the musical are likely to be enthralled by the film, and even non-aficionados like myself can find it a stirring and enjoyable experience. Be warned, though, that if musicals are not your cup of tea, you are unlikely to enjoy yourself, and the 2 1/2 hours that pass briskly for those enjoying themselves may seem interminable for those who are not. For those who know what they are getting into, however, Les Mis is one of the most sweeping, stirring, and emotionally powerful musicals to hit theater screens in some time, as rousing as its stage ancestor, and well worth the price of admission for fans of the medium.